For my birthday I wanted a dress watch with a complication that I have not had before. In this case, I really wanted a dress watch with a power reserve indicator. 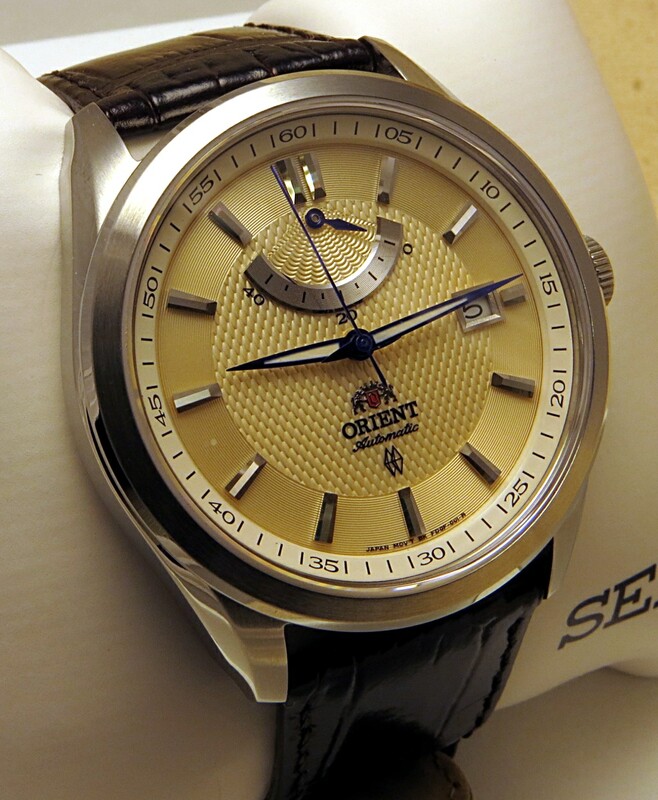 I ended up getting an Orient FFD0F004W0 automatic watch with power reserve. It has all the styling of a classic watch, but with modern sizing and proportions. It also has the modern touches, which I will visit below. Let us start with the dial. It is a richly textured champagne colored dial. The center, which is just a touch wider than the hour hand radius, is a woven texture. The area between the woven center and the chapter ring is concentric rings. Beneath the power reserve indicator it looks like tiny curtain bunting. The hour markers are applied trapezoids with a brushed top and polished sides. They stand out very well from the dial. The 12 o’clock indicator has two markers. The chapter ring used traditional Arabic numbers for every five minutes, and simple ticks for the minute markers. It is very reticent of a pocket watch I have as well. At the three o’clock position is the date indicator, ringed in brushed chrome. The date wheel is white with black numbering. The power reserve indicator is located between the eleven and one o’clock position. It can show up to forty hours of reserve. This is a new complication for my collection, it shows how many hours of wind are left on the mainspring. I have found it to be fairly accurate, the watch usually goes 42 hours on a full wind. The hands are dauphin shaped and blued. The hour and minute hands have luminous material, but the markers on the dial do not. The second hand is a simple, blued stick hand and is a nice length that extends all the way to the chapter ring. The power reserve indicator hand is also dauphin and blued steel. The dial of the watch is relatively free of verbiage. 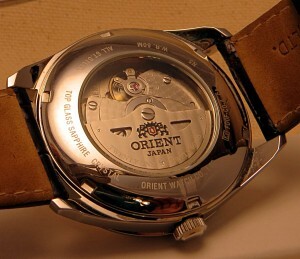 Just below the center of the dial is the Orient twin lion logo with e ORIENT AUTOMATIC and the two crystals indicating a sapphire crystal. In tiny print at the bottom of the dial is Japan Mov’t FDOF-CO-A. Overall, the dial is well proportioned with proper length hands and easy to see markers. 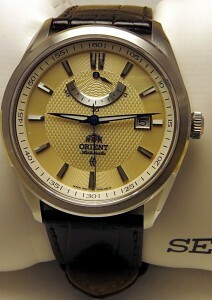 The luminous material is the typical, next to useless Orient lume. 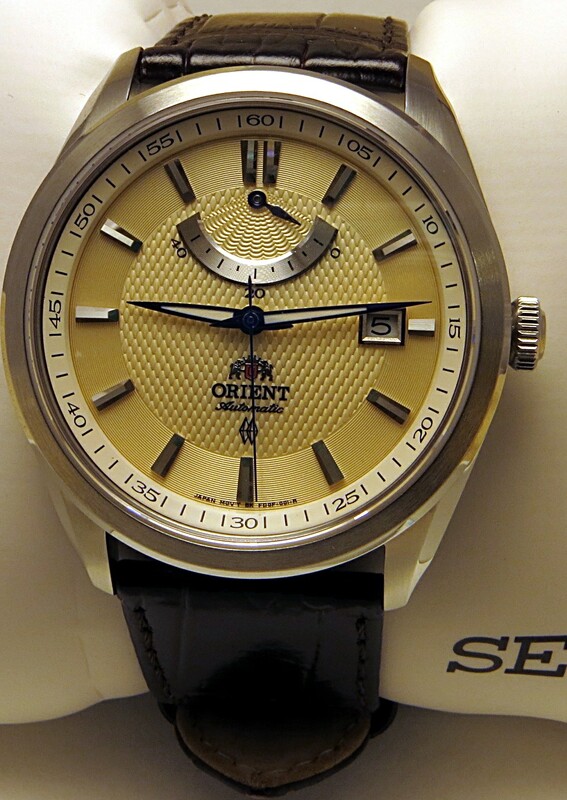 I really don’t know why Seiko does not give Orient a couple of cans of Lumibrite to do Orient’s dials. Even the cheapest Seiko 5’s have much better luminous material. 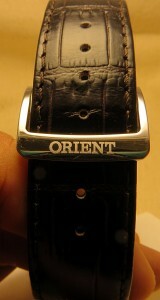 It is my only complaint with Orient watches. That being said, this is a dress watch and it is great in that respect. I would say the fit and finish of the dial and hands can go toe to toe with anything from Switzerland. The crystal is flat sapphire, with anti-reflective coating. The bezel is brushed steel, sloping away from the crystal. The top and side of the case is brushed, but there are polished accents on the bezel, lugs and case of the watch. The case is a modern, 40mm in diameter. The crown is at the traditional 3 o’clock position and unsigned. It does not wind the watch, only sets time. The first position is the quick set date, the second is for setting the time. 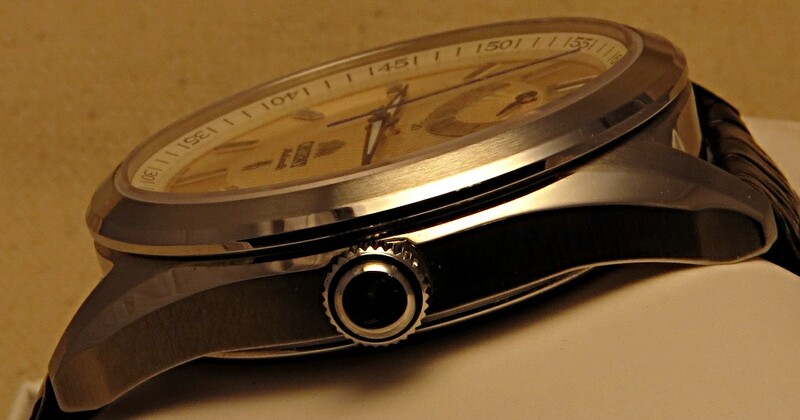 The lugs are 22mm and well proportioned to the watch. The inside of the lugs is highly polished. The overall case fit and finish is excellent. Continuing on with the overall quality of the watch is the leather band. It is a genuine leather band, crocodile pattern, 22mm at the lugs and tapers 20mm. 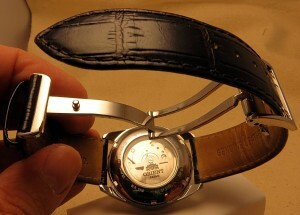 The watch came with a factory two button deployant clasp, a great touch class for a watch in this price range. The deployant has a high polish, stainless steel, and marked Orient. It works flawlessly and is very comfortable. I am sure it will extend the life of the leather band and it just looks cool when you take it off. This watch, I am almost tempted to call it a timepiece, is a wonderfully balanced piece. No corners were cut. Everything from the finish of the case, to the sapphire crystal, to the high finishing of the movement just screams quality. I recently visited a jewelry store that sells Hamilton watches. This Orient had features that watches that cost five to ten times as much didn’t have, like a deployant clasp on the band and a well decorated movement. Even the finish of the watch dial is better on the Orient. Overall, I am very very happy with this watch. It is handsome, modern, and will look just as good in 30 years as it does now. If you are in the market for a dress watch, check it out. There are other color combinations and dials, black, white, and some come on a steel bracelet. For the price point, less than $400, you really can’t beat it. Case: 40mm diameter, stainless steel, 50M water resistance. Back: Stainless Steel with display crystal, screw down. Crystal: Sapphire, flat, anti-reflective coating. Movement: Automatic, 46N45, Orient In house design and manufacture, Japan Made, decorated . Other: Genuine Leather band, with two button deployant, Luminous Hands.